I fell back in love with bananas over the weekend. As we made our way through the produce section on our last trip to Stop N’ Shop, I inexplicably drifted toward the yellow pyramid of bananas. As I mindlessly picked up a bunch, I thought to myself “when was the last time I actually ate a banana? And why has it been so long?” Honestly, I think the last time I ate a raw banana was sometime in April or May. My reason for quitting the ‘nanas? I wanted to stay away from fructose. Seriously. At the time, I was tediously counting my carbs and watching my sugar intake. According to the USDA, bananas have 31g of carbs and 16g of sugar, and even though the sugar is from a natural source, I considered that too much. I stopped eating bananas all together. While I gazed lovingly at the bananas in my hand, I was reminded of one of my favorite blog posts by Melissa Urban of Urban Gets Diesel and Whole9: The Carrot Train to Crazytown. (If you haven’t yet discovered this blog/website, I highly suggest you check it out.) Basically, the point of the post is that yes, there are some fruits and vegetables that are higher in sugar than others. BUT they’re still fruits and vegetables, which means they are much better options than, say, coffee cake muffins from Dunkin’ Donuts. Keeping Melissa’s post in mind, I purchased a bunch o’ bananas. I’m so glad that I did! I discovered that I really missed them. Especially when paired with almond butter and a little coconut (back in my vegetarian days, bananas and peanut butter were two of my four main food groups. The others being wheat bread and Honey Bunches of Oats). 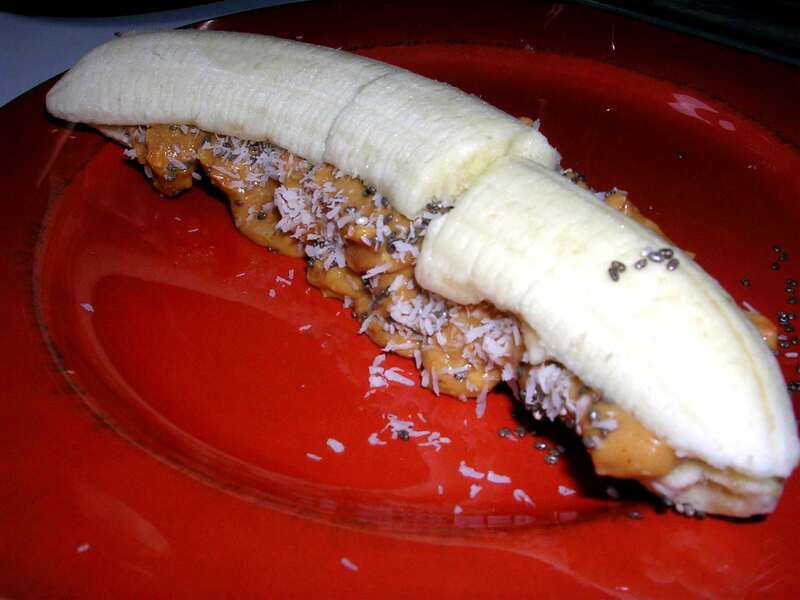 My breakfast of choice this weekend was a banana sandwich with Barney Butter, coconut and chia seeds, an idea I got from Caitlin at Healthy Tipping Point. 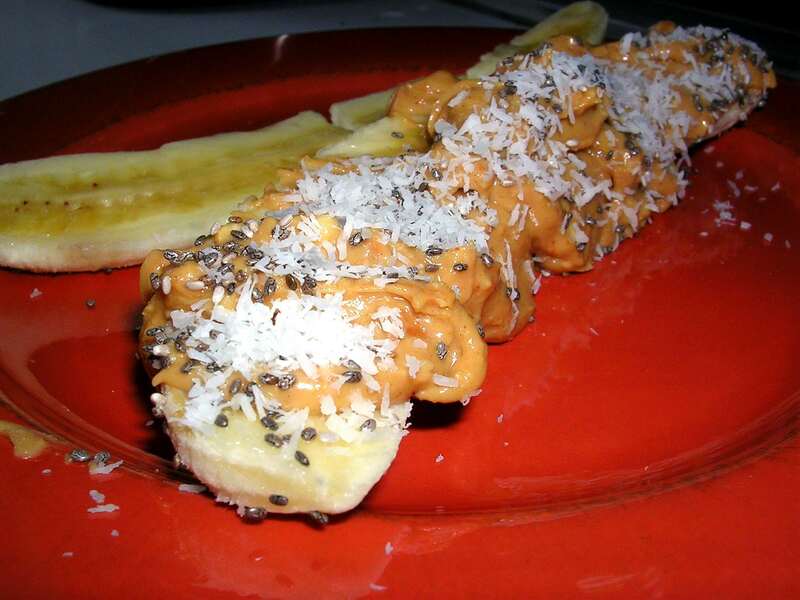 I cut the banana lengthwise, slathered with almond butter and sprinkled with chia seeds and coconut. I ate this Saturday and Sunday about an hour before my workouts. I’m definitely not in the mood for bananas everyday like I used to be, but I like having them around as an option. 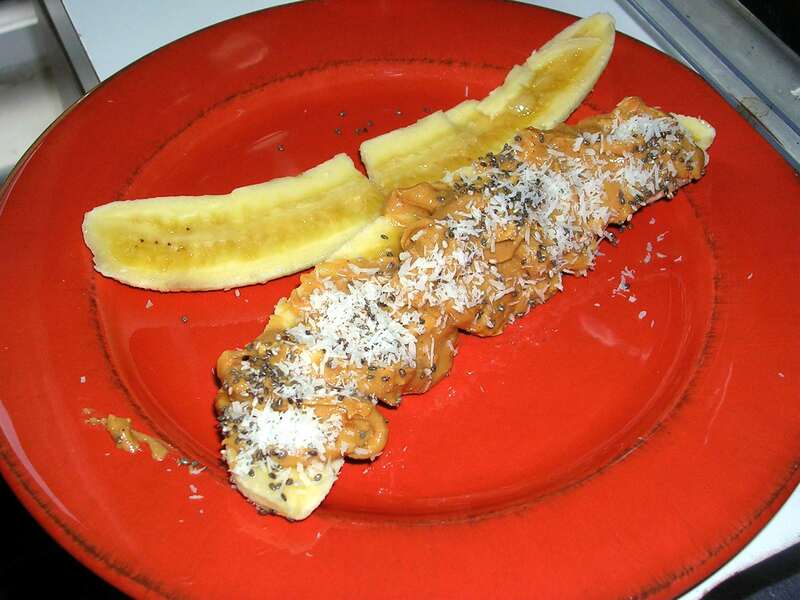 Quitting bananas was my ticket to Crazytown. They keep me sane and they keep things in perspective. Bananas are still a fruit, although higher in sugar than some others, and thus they are not a bad choice when looking for something sweet. Eating three pounds of bananas a day might not be the best idea, but, eating three pounds of anything in a day probably isn’t the best idea…just ask the lady that ended up in a coma after eating too much bok choy. That’s a very interesting banana sandwich! lol I don’t crave bananas like I used to anymore either! But I do love banana pancakes like no one’s business!